For those who don’t know, I’m currently a college student. Although college life is fun and all, there are some … challenges. One of them being roommates. Depending on who you get, you could be best of friends or become worst enemies. Luckily, I don’t think I’ve ever HATED one of my roommates, but they have gotten on my nerves on more than one occasion. 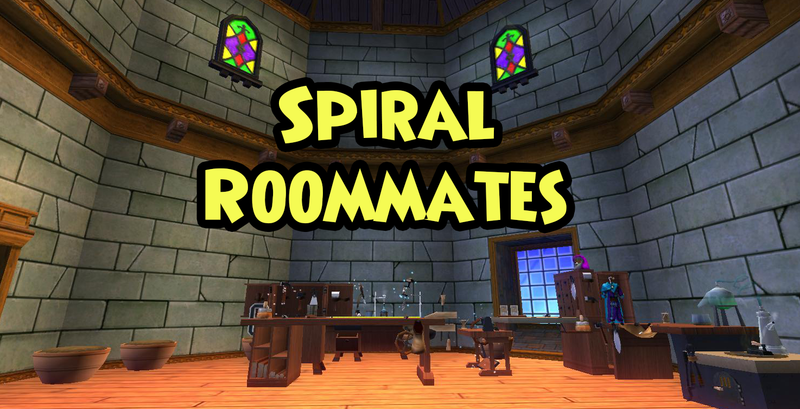 Inspired by my college roommate struggles, enjoy this list of roommates who I’d hate to have in the spiral. The messy roommate. After a long day of defeating all sorts of enemies and saving the spiral for the thousandth time, I don’t want to be tripping over clothes, wands, spellbooks, or leftover pet snacks on my way to bed. I’m clumsy as it is! The “Everything that’s yours is mine” roommate. Don’t touch that! That’s my favorite wand! Break it, and you’re replacing it! I think it’s just safer for everyone if my roommate didn’t try to use my stuff without asking first. One minute everything could be fine … next thing you know there could be another gaping hole in Ravenwood if my roommate swings that staff the wrong way. The “Storm Caiman” roommate. If you don’t remember from Azteca, Storm Caiman SPEAKS IN ALL CAPS. I don’t mind loudness every once in awhile, but ALL THE TIME?! Learning to master myth requires intense studying and concentration. Someone constantly yelling at me doesn’t seem like the perfect atmosphere for that. Any gobbler. Could you imagine rooming with a gobbler?! They’d eat all my food! Nooooooooooooo!! !